"I never would have been President if it had not been for my experiences in North Dakota." Theodore Roosevelt, the 26th president of the United States, came to the Badlands of what is now North Dakota for the first time in 1883. Excited about the prospects for an open-range cattle industry, he invested in a ranch along the Little Missouri River near Medora before returning to New York. The following year he returned, seeking solace after the deaths of his mother and his young wife on the same terrible day in February. He later recalled that “the romance of my life” began in this rugged country. His admiration for the rough virtues and the rugged integrity of the men with whom he worked in the Dakotas “took the snob out of him” and inspired him to organize the Rough Riders, which brought him national fame during the Spanish-American War. His love for “the great free ranches, with their barbarous, picturesque, and curiously fascinating surroundings,” helped create his deep commitment to the conservation of America’s natural resources. If Roosevelt were to return to the park that bears his name, he would find the topography, plants, and wildlife essentially unchanged from what he knew. In the fall of 1883, Roosevelt, a young New York legislator, made his first trip to the Badlands of the Dakota Territory to hunt buffalo and other game. By the end of his 15-day hunting trip, his enthusiasm for the prospects of the cattle industry led him to invest in the Maltese Cross Ranch, near the town of Medora. At Roosevelt's request, ranch managers built a one and one-half story cabin complete with a shingle roof and cellar. Constructed of durable ponderosa pine logs cut and floated down the Little Missouri River, the cabin was quite luxurious for the Dakota frontier, with wooden floors and three separate rooms (kitchen, living room and bedroom). A prolific writer, Roosevelt spent many lamp-lit hours at the desk in the living room. The steeply pitched roof created a sleeping loft for the ranch hands. Roosevelt returned to New York, winning reelection to his last term in the State legislature in November. In February 1884, Roosevelt's young wife died, two days after the birth of their daughter, Alice, and only hours after his mother's death in the same house. After leading the New York delegation to the 1884 Republican Convention in June, Roosevelt left for the Dakota Territory. He found a ranching boom in progress in the Little Missouri River Valley. Encouraged by the success of his Maltese Cross Ranch, he purchased 1,000 head of cattle and selected a site for a second ranch. Elkhorn Ranch, about 35 miles north of Medora, became headquarters for Roosevelt's cattle operations. Completed by the spring of 1885, the 30’ by 60’ Elkhorn Ranch house was one of the finest in the Badlands, with eight rooms and a porch on the east elevation. Roosevelt’s ranching business reached a peak in 1885 and 1886, but disaster struck during the winter of 1886 and 1887. More cattle already were grazing on the open range than it could support by the fall of 1886. Winter brought heavy snows, partial thawing, and subzero temperatures that created a crust over the snow that the cattle could not break through. When Roosevelt returned in the spring of 1887, he learned that he had lost over half his herd. By the early 1890s, he had abandoned his Elkhorn Ranch and returned to the Maltese Cross Ranch. He came back periodically to the area until 1898, but felt that open-range ranching in Dakota Territory was “doomed, and can hardly outlast the century.” He sold the last of his stock in 1898. Roosevelt lost much of his fortune in the Badlands but never regretted the time he spent there. Among other things, his years in Dakota Territory helped inspire his romanticized, multivolume The Winning of the West. Roosevelt visited Medora in 1903 on a presidential tour of the West. Practically the entire population of the Badlands turned out to greet him. Efforts to create a national park commemorating his life in the Badlands began shortly after his death in 1919. Theodore Roosevelt National Park consists of three units along the Little Missouri River. 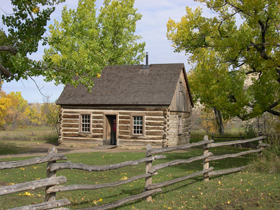 The South Unit, near Medora, includes a Visitor Center and the restored Maltese Cross Cabin, the only surviving building from either of Roosevelt’s ranches. Dismantled in 1904, the cabin traveled to fairs in Portland, Oregon and St. Louis. For several years in the 1950s, it stood on the State capitol grounds in Bismarck. The National Park Service relocated it to its present site in 1959 and restored it to its original appearance. The cabin contains a number of items that belonged to Roosevelt, as well as other typical furnishings of the day. 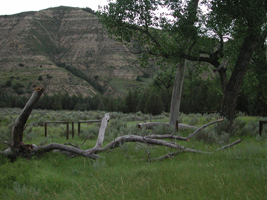 The Elkhorn Ranch Unit is located 35 miles north of the South Unit Visitor Center. The ranch buildings no longer exist, but interpretive signs tell where the house and outbuildings were. The North Unit features a Visitor Center, a 14-mile scenic road, and a number of trails. Cattle no longer graze on the 110 square miles that make up the park; today, this stark but beautiful landscape again supports herds of bison and mule deer. The South Unit also includes the Peaceful Valley Ranch house. Built between 1883 and 1890, it is contemporary with Theodore Roosevelt’s Elkhorn Ranch house and is one of only a few surviving dwellings associated with open-range ranching in North Dakota that have not been moved from their original locations. The Theodore Roosevelt National Park, a unit of the National Park System, consists of three units located between Watford City, ND, on the north, and Medora on the south. The Elkhorn Ranch Unit, which was the location of Roosevelt's principal home in the badlands, is located 35 miles north of the South Unit Visitor Center. The Visitor Center and park headquarters are at Medora. Click here for the National Register of Historic Places file: text and photos for the Peaceful Valley Ranch in the South Unit of the park. The park is open year round 24 hours a day. Portions of the South Unit Scenic Loop Drive and North Unit Scenic Road may be closed occasionally in winter due to snow and ice. Numerous activities are available in the park including: backcountry camping, bicycling, bird watching, canoeing/kayaking, snowshoeing, fishing, hiking, horseback riding, and guided tours. For more information, including visitor center hours and detailed driving directions, visit the National Park Service Theodore Roosevelt National Park or call 701-623-4466. Theodore Roosevelt’s Maltese Cross-Ranch Cabin was documented by the National Park Service’s Historic American Buildings Survey prior to restoration, when it was still on the capitol grounds in Bismarck.